So, what do you think about rodeos? 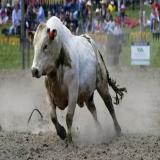 Rodeo events include calf-roping, steer wrestling and bull riding, all of which rely on inflicting pain and fear in animals to get them to perform. Rodeos contain deliberate cruelty, such as using electric prods and rope burning, but they also rely on inherent cruelty by exposing animals to rougher behaviour than they'd ever experience on a farm or props such as flank straps provoking distress. A rodeo featuring a bull quietly chewing its cud, as it would on a farm, wouldn't be fun to watch so a variety of means are employed to make the animals run, jump and buck. Common injuries include broken ribs, backs and legs, punctured lungs, deep internal organ bruising, haemorrhaging, ripped tendons, torn or stretched ligaments and muscles, broken necks, torn trachea, spinal damage and disc rupture, bruising, and subcutaneous tissue damage. One of the worst events is calf-roping, which involves calves as young as three months old fleeing at speed from a rider on a horse. The rider lassos the calf around the neck, jerking it violently off its feet, then dismounts and wrestles the animal to the ground and ties its legs together. While there is a Code of Welfare, the body responsible for it, the National Animal Welfare Advisory Committee, has previously noted that it "does continue to have reservations about the performance of rodeos, and in particular, the events using young animals".